You’d live and love the rest the Cowboy Way. You’d work long, hard, honest---and love the same. Know you mean it until the very end. Like a story written on the wind-blown sands. The grass, the cows, the antelope and clouds. Seein’ Life happen ’cause of you makes you proud. When they take it makes 'em proudest of all. Guided by a code you call: The Cowboy Way. 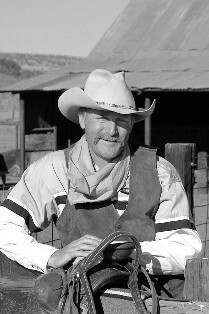 Mike Moutoux (pronounced "moo-toe") is a "cowboy poet" who lives in New Mexico and works on area ranches where most work is done on horseback. He's been writing and performing this distinctive genre of poetry and music since 2002 and was nominated for the Western Music Association?s "Cowboy Poet of the Year" in 2006. When he?s not riding the range, Mike performs at schools and festivals across the U.S. Read more of his work at https://mikemoutoux.com/. Youâ€™ll meet folks keepinâ€™ a ranch together like their parents did "Despite random rains and markets when they fall, Working and praying to give their children the same chance When they take it makes â€˜em proudest of all." Isn't this what we hope for all of our children?